Christopher Knowles has coined a new term, The ELUSIVE COMPANION HYPOTHESIS as a way to better articulate the elusive meta-weirdness that surrounds the UFO phenomenon. This term Elusive Companion Hypothesis (ECH) emerged during a series of five excellent posts on THE SECRET SUN. I strongly urge you to read each one of these essays. Trust me on this. Stanley Kubrick and Jack Kirby both attempt to redefine the scope of their respective crafts. Each use overtly mythic imagery to bypass the normal pathways, and ends up rewiring a hidden part of our psyche. The stories brought back by alien abductees have the same sweeping power. From left to right: The Reptilian, the Human and the Nordic. 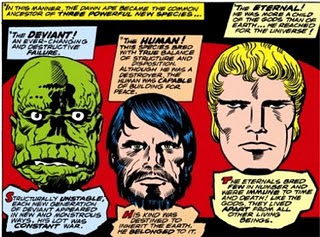 In his blog postings Mr. Knowles expounds on the overt imagery of Jack Kirby's epic comic book THE ETERNALS. This set of farsighted essays paints a swirling entanglement of UFOs, Jack Kirby, Stanley Kubrick, Arthur C. Clarke, ancient astronauts, synchronicities, The Watchers, science fiction, nightmares, human evolution - and - alien abductees. I also ask him about a very creepy glowing figure that Chris saw last summer at night with his dog, and this experience is downright (sorry to use the word, but) paranormal! What does Buzz know that he’s not telling us? Mr. Knowles speculates that if there's a signal out there, it’s being filtered out. Shamans, occultists, sick children and other thought-criminals seem to pick up on the signal when the stars are all aligned. It's a fleeting state, but it's driven forward our evolution in ways we don't quite understand. And sometimes, even humble “Joe Normal” gets zapped by this signal on his very own road to Damascus. And even Haywood Floyd got zapped in a 40 foot pit on the moon. Great stuff as always, Mike. Keep up the good work! It's funny how I strongly disagree with Chris' assertion that Floyd is "the bad guy" in the 2001 movie, even though it's a perfectly logical conclusion. I guess that my viewpoint is colored by the sequels (movie & books) to 2001 —specially the movie 2010: The Year We Make Contact; obviously not on par with Kubrick's masterpiece visually and narratively, but in my mind I'll always remember fondly of Floyd, because he was brilliantly personified by the late Roy Scheider... who, oddly enough, looked *a lot* like Ufologist (and contactee) Ray Stanford. No sympathy for men wearing suits that tow the party line. Haywood Floyd was toady for THE MAN. He's a villain, albeit a charming one - but a villain none the less. I wonder if he ever got his daughter a bush baby? OK, he *was* the villain in 2001. But in 2010 he seeks atonement by risking his life and flying to Jupiter in search for Bowman and the Discovery. 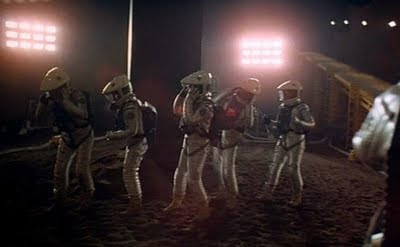 But here's the deal on Floyd if we continue in this Apollo vein- Floyd's daughter is played by Kubrick's daughter. Floyd takes the team to the Monolith to have it what?-- photographed. Floyd keeps his mouth shut under very intense scrutiny. Some projection on Kubrick's part? The New Jersey meteor story. Chris and I talk about this. The day he coined the ECH. 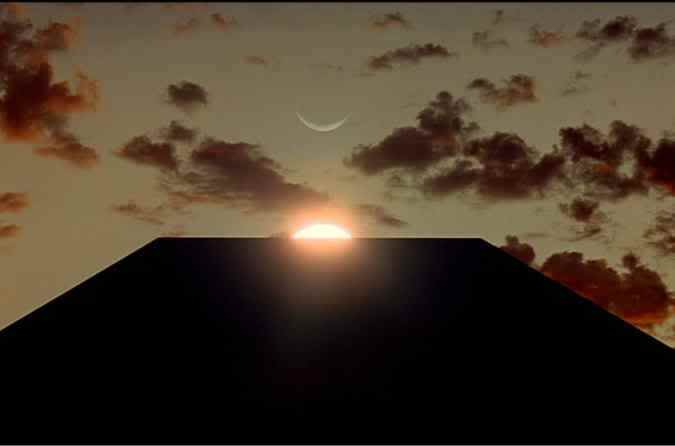 (don't forget,the Monolith was a translucent crystal in the book,while in the film it is the same dimensions as a cinema screen and is black,hence when the movie starts,you're supposed to be looking at the Monolith),while Arthur C. Clarke was mainly responsible for where the books went with the story. "The Shining" is a good example of how director and author can take the same story and interpret it differently,to each others disgust. Stephen King has been quoted as saying that although Kubrick made a film with memorable imagery, it was not a good adaptation of his novel,and is the only adaptation of his novels that he could "remember hating"
"The Cryptoterrestrials" by Mac Tonnies,something inside my head just couldn't except the word Cryptoterrestrials.I kept thinking of mummies coming out of their tombs,when I read the word Cryptoterrestrials. I like Elusive Companions a bit better,but then again Cryptoterrestrials don't have to be your companions,either. Elusive Entities Hypothesis might be a better term. And re. The Shining, it doesn't surprise me King would say that, considering how much Kubrick changed the story —like the part in the book where the hedges are 'animated' by the boy, and all that— but the movie's plot needed to be 'tighter'.